In this letter Martha Berry tells Mr. Naegle that she left the pictures with McCrary and Co. in Atlanta. She also tells him that he should come visit Sunday the 26th and to bring Mrs. Naegle and any other friends who are interested. 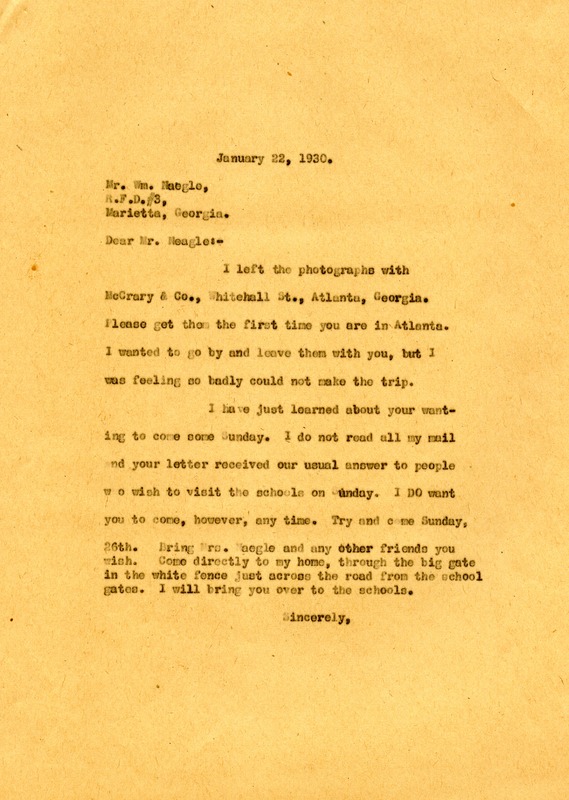 Miss Martha Berry, “Letter to Mr. Naegle from Martha Berry.” Martha Berry Digital Archive. Eds. Schlitz, Stephanie A., Rachel Renaud, Jordan Brannen, Chelsea Risley, et al. Mount Berry: Berry College, 2014. accessed April 21, 2019, https://mbda.berry.edu/items/show/13530.